Croning coring is ideally suited for thin cores, to be handled with care, or with complex shapes and for assembly requiring high accuracy. 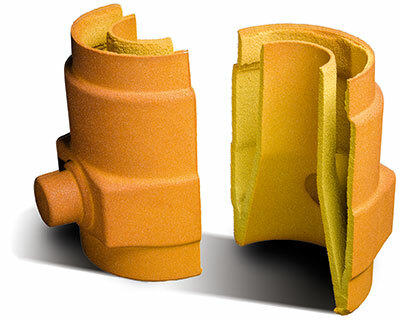 Complex cores, with high demands on or meeting specific needs can be processed with formulations made of specific sands, with a high quantity of binding and additives, such as core assemblies, cores for hydrolics and tight precision as-cast borings .Whenever it is possible, these cores will be hollowed in order to benefit from weight savings and easier gas release, which will reduce shell solidification times by draining calories. 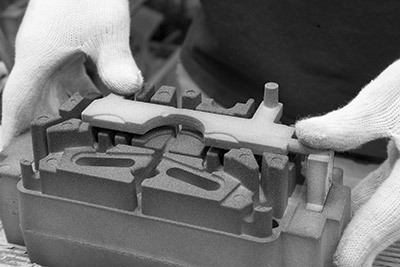 You can also produce « external » cores, using all or part of a piece, in order to take advantage of croning moulding on a local basis, as these core walls can usually be recast with a sand or shell mould. In the first place, your recasting times are optimized thanks to easier handlings, increasing your productivity. In a second place, you drastically reduce sand recycling. Between croning cores and moulds, we usually use 0.05 mm plays by face. Surfaces have low relieves (3 to 5°) as parts to be joined are hard. As surfaces between croning cores must match concentricity and dimensions continuity, they have a conical shape and fit with hot bonding.